And this year was no exception.!! Taking and posing for photos!! The past 8 days (From 8th to 15th November, 2011) kept me very happy. The excitement factor hung around me. I felt too proud to be a civilian of Kalpathy. Everything seemed picture perfect until yesterday night. 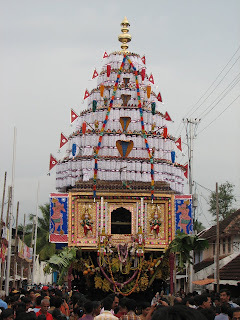 Shivan Kovil. The Theru went over his chest and I don't think I have to say what happened!! Incidentally, I happen to know this boy. he used to come to my mother for tuition. "A brilliant boy", amma says. God is said to be the ultimate guard. And he could not take care of this young boy?? Death is not a matter at all. That which is born must die. And by the chariot carrying God??!!! Is this what Kalyug all about?? Or is our present generation fools?? Day before yesterday - On the 1st day of Theru -God did give some omens. The local folks were not able place Lord Ganesha into the chariot. They tried really hard and for a really long time. Yet, God was very reluctant to get in. After putting himalayan effprt, they succeeded in keeping Him into the chariot. Then, the the rope using which the majestic Theru of Lord Shiva will be pulled managed to break in between. It took almost an hour to resume the car festival. But we oh-so-believers-of-science ignored all of them. And may be, this is kalyug!! Its the boy's family who is going to suffer the loss. After yesterday's mishap, parents will be praying forever that their child should be safe during the rath-yatra or any such public events for that matter. And that... God always does the right thing!! Its easy to fool heart than to feel the pain!!! Thats a very positive way of seeing things Suraj!! !